On the San Blas islands, off the Caribbean coast of Panama, the indigenous Guna people have chosen to remain independent as their own nation. They live on low sand islands with only coconut trees and fishing for sustenance. They have no electricity, running water, glass windows, doors or floors in their houses. The one thing that every Guna has, is immediate access to a cell phone. Somewhere in each “village” is a solar panel connected to a car battery – the recharging station. The Guna use their phones for personal communications, but more important, to get word from the mainland when it’s time to hop in the boat and pick up a load of tourists from the mainland or deliver a load of coconuts. Wealth created by information. The Jevon Paradox is in fact a natural result of a healthy economy and the rise of energy-using consumer products. Attempts to artificially restrict access to energy disproportionately damages the less wealthy, suppressing their ability to generate wealth and increasing wealth inequality. Cell phones and the Internet are essential wealth-creating personal technologies dependent on increasing supplies of low cost energy. Today we know more about demographics than Jevon and the markets and the products that drive demand, so we need to bring the terminology up to date. First, efficiency is a proxy for price. Then, money is a proxy for energy. Today, energy demand is driven by mass distribution of energy-using consumer products. In the 1860s, the products being sold to consumers were primarily artifacts, which did not require additional energy to use – pots and pans, buggy whips, furniture and such. The Franklin Stove and its kin were probably the major energy-using appliance in most households. With the advent of electricity and automobiles, energy using consumer products became commonplace. Energy-using consumer products have ongoing energy requirements for their operation. Therefore, as the purchase price and/or cost of energy falls, adoption and cumulative energy demand increases. An obvious example of Jevon’s Paradox today is the sales of light trucks and SUVs in the United States. As the charts show, the falling price of gasoline (proxy for efficiency) is correlated with an increase in sales of larger, less efficient SUVs, increasing overall fuel consumption. The number of cars also determines the number of services needed to keep them running – insurance, licensing, repairs, accidents, roads, parking lots, etc. In the end, the total ecosystem cost for the automobile fleet and the energy it uses is dependent on the number of cars, multiplied by their specific characteristics. This is the result of a healthy economy based on energy-using products. As the market penetration of these products rises, the aggregate energy consumption is added to the total energy usage of the society. Refrigerators, toasters, microwaves, washers and dryers all add to the cumulative energy demand. We now add information products, which also come with ever increasing energy-use profiles. Cell phones are a prime example of energy usage in the information age. If cell phones cost $3,000 each, the market for them would probably be limited to the wealthy elites. However, as the price drops, cell phones begin to penetrate the less-wealthy markets, with nonlinear increases in the number of phones. Today, phones range from $1000 iPhones to $20 burners, or even less for castoffs. Anyone who wants a phone can have one, even in third world countries. However, the infrastructure costs of the phone ecosystem are relatively constant per user. Cell towers, networks, data centers, billing systems, even sales and marketing are driven largely by the raw number of phones out there. Users pay for minutes to keep the system operating and making profit. Overall energy consumption increases more or less directly with the number of phones in service. With smart phones, Internet access becomes an extension of that system, demanding yet more back-end energy. Some estimates claim that the information industry today uses around 15% of total energy production, although these figures are nothing more than wild guesses. The total should include not only all the end-user products, but all of the transmission, distribution, data centers and manufacturing. Now include the energy requirements of the secondary industries including marketing, sales, advertising, app and content development, engineering, tech support and transportation. Think about the billions of wifi routers running 24/7 around the world. How about all the televisions. These charts show the population of the U.S (Green) plotted against wealth (approximate – the top 5% is truncated so the chart will fit on a page at the scale shown). The red line shows a hypothetical declining product price curve. It can be viewed as the maximum price at any point along the line were a person at that wealth level would buy the product. 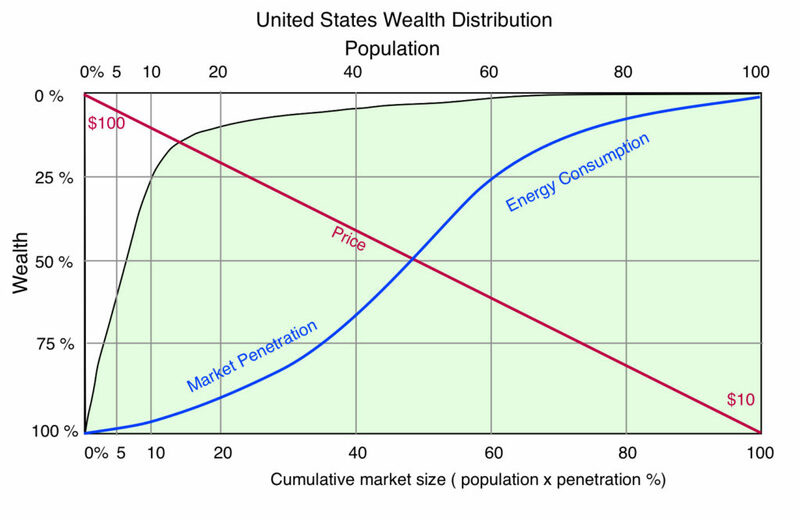 The blue line represents gross market penetration – how many people out of the entire population own the product. At first, wealthy people (and early adopters) buy without concern for price, but there are relatively few of them, so market share grows slowly. As price decreases, it reaches the steeply rising part of the adoption curve. Sales grow rapidly. At the tail of the curve, the very poor eventually come on board as the price drops to a manageable level. This curve is a variation of the well known early-adopter, middle-adopter, late-adopter bell curve taught to marketing students. In the middle part of the curve, adoption rate increases faster than price decreases (or in his case, efficiency increases). In the early days of the steam revolution, this is no doubt what Jevon observed that caused his concern. It is not actually a paradox, it is the natural functioning of a healthy economy driven by energy-using products. Jevon’s solution, like alarmists today, was to promote rationing, or to artificially inflate the price of energy and try and slow the overall energy growth. 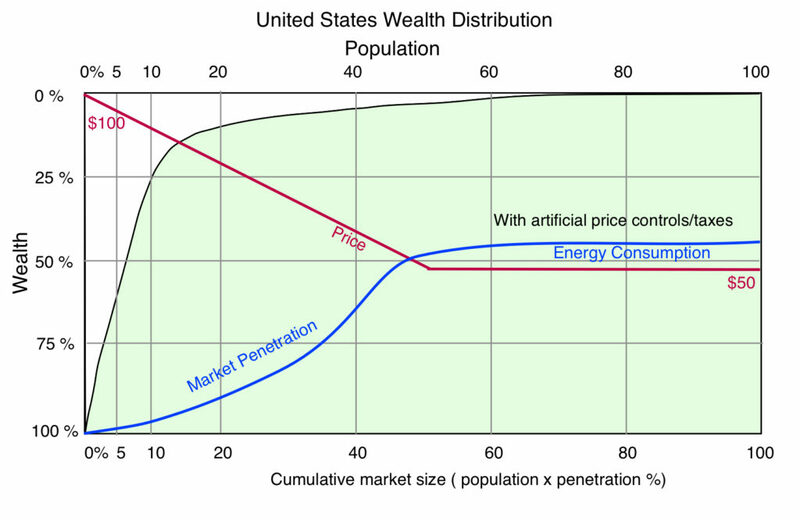 The second chart demonstrates that resulting higher prices are devastating to the poorest end of the wealth curve, effectively depriving them of access to products and services enjoyed by the wealthier segments and which the marketplace is ready and willing to provide – especially information products that are essential for effective functioning and wealth creation in modern society. In his far-reaching book, The Physics of Life, Professor Adrian Bejan shows how the Constructal Law of physics affects and in a sense “directs” every aspect of the energetic evolution of the universe, from the formation of stars to the evolution of artificial intelligence. The Constructal Law was formulated in 1996 by Professor Bejan, an eminent expert in thermodynamics at Duke University, whose papers on thermodynamics are among the most highly referenced by other scientists. To simplify slightly, it states that any energetic flow must, if it is to evolve (live), morph its channel to increase access to its own flows. Unless they are constrained, energetic flows only (and always) increase the size of their channel. However, the process is far from random. It is driven by the basic physics of flows and channels. It explains the shape of river deltas, the architecture of trees, blood flows in your veins, the size and speed of animals and much more – including the flows of information on the internet and the flows of wealth (a proxy for energy) in human societal life forms. In our personal lives we value success, wealth and access to more powerful machines precisely because these things amplify the amount of energy that we can command, thereby presumably enabling us to create yet more wealth and access more energy. In short, all life forms use small amounts of energy to harness larger amounts – energy amplification. A tree uses the energy it harvests and stores to grow and thus have access to yet more sun and CO2 which in turn provides energy for growth and reproduction. When you get into a car and press the accelerator, that tiny amount of energy (and your intelligent control), amplifies your biological energy to propel you across the landscape hundreds of times further and faster than you could accomplish on foot. t. The principle of energy amplification universally applies to all life forms, separating life from the inevitable running down dictated by the second law of thermodynamics. How this works for all life forms is described in my article, Introduction to the Theory of Constructal Evolution. A new paper by Adrian Bejan and Marcelo Errera, Wealth Inequality: The Physics Basis, highlights the relationship between energy use and wealth among all the countries of the world. 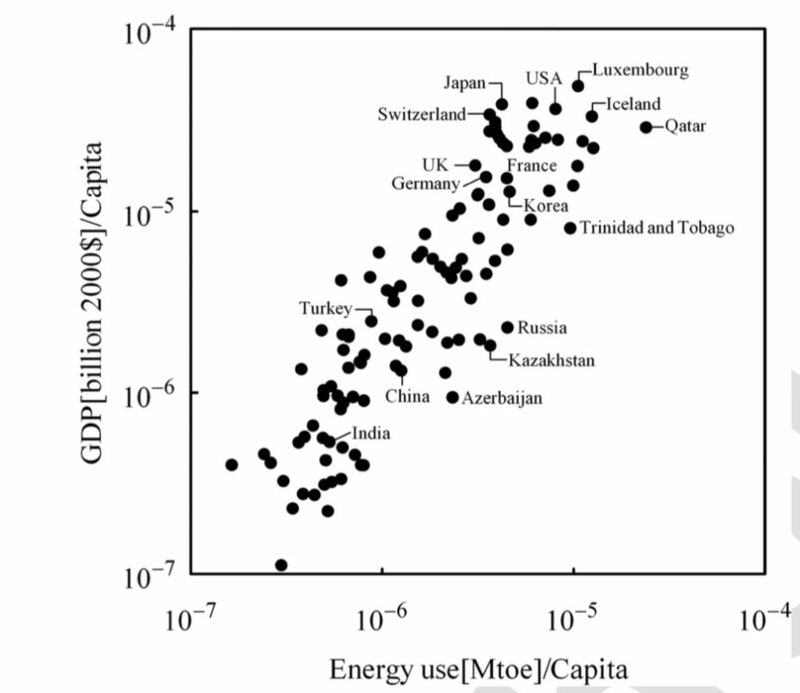 The growth in wealth of every country follows a straight line with their increasing use of energy, measured both against total GDP and GDP per capita. Their paper proves that the wealth inequalities we observe in every country are inherent, created by the physics of energy flows and the complexity of the society. Bejan and Erera show that wealth inequality is a natural consequence of the physics of energy and movement in a heterogeneous population. Then, to quote: “Design change that facilitates global flow [money, energy] is adopted and persists. It survives. The evolution of money was a dramatic change for facilitating the flow of traded goods, a huge change relative to trading in nature.” In the same way, the Internet has led to increased flows of information, vastly increasing our access to information that we can integrate into our knowledge, multiplying our ability to harvest energy to increase our own wealth. For the poor, information services are the shortest route to increasing personal wealth. With rapidly dropping prices, vast swaths of the global population are moving directly to smartphones, tapping the power of the Internet and increasing their personal access to wealth. Streaming movies and music, AI, cloud storage, Facebook, Instagram and Whatsapp among thousands of other services, are driving massive increases in information demand worldwide. The forward-looking energy demand for this sector is far beyond what simple efficiency gains are going to provide. Already, massive data centers are being sited adjacent to large hydroelectric dams to take advantage of their relatively cheap and dependable power. As our global brain develops, we need to be planning for more energy growth, not less. I am making the argument that providing more energy to more people everywhere on the planet at ever lower cost is necessary to lift its people above subsistence to build wealth of their own. We have to recognize that the demand for inexpensive energy will grow as we do this and that is a good thing. No amount of “efficiency” or regressive attempts to restrict energy supplies will provide resources for the future. One thing is for sure – the more energy we have available to us, the faster we will evolve as a species, the wealthier we will all be and the more energy we will need. The flowing, evolving progress of the human race and life itself demands it.